Have you ever tried okra soup? Well, I loved okra even before we moved to the South. So when I saw a recipe for Okra Soup on Close to Home, my assignment during a food blogger challenge, I knew this would be a perfect cold weather soup for a recipe makeover. I’ve taken Maria’s version of Okra Soup that is based on this recipe at Saveur.com and made some changes like using pancetta instead of bacon and fresh thyme from the garden instead of dried. To save time when making Easy Tomato & Okra Soup, I used canned fire roasted diced tomatoes instead of whole, peeled tomatoes so I wouldn’t have to crush them by hand. I love Muir Glen Organic Fire Roasted Diced Tomatoes. Hunt's Fire Roasted Diced Tomatoes are great, too. For this easy okra soup recipe, I used pre-diced pancetta, which you can find in the high end deli section next to deli sliced salami. If you can’t find pancetta for your Easy Tomato & Okra Soup, you can use bacon. Just cut it into small pieces before cooking. However, the real time saving trick was to use frozen, diced okra for this okra soup recipe. Since fresh okra costs twice as much as frozen, it’s also a way to cut costs. Finally, don’t boil the okra into a mush. I like the okra to be cooked through, but still have a crunch to it. This okra soup recipe is a double batch, so you’ll need to make it in a large stock pot. I make big batches of Easy Tomato & Okra Soup so we’d have plenty left over for take to school and work lunches. You can also freeze half of this okra soup recipe in freezer storage containers for a soup and salad lunch or dinner. Okra is packed with all kinds of terrific nutrients. It’s a high fiber food, which helps lower cholesterol and helps with digestion. Half a cup of cooked okra contains nearly 10 percent of the recommended levels of vitamin B6 and folic acid, too. Okra’s also a good source of calcium and magnesium. It’s also a source of vegetable protein - 1/2 cup has 1.5 grams! Do you like soup? Check out my recipes for A Spicy Kale Soup Recipe and A 30-minute Pozole Recipe. In a large stock pot, heat oil and bacon over medium-high heat. Cook, stirring, until fat renders, about 5 minutes. Add thyme, garlic, onion, celery, and bay leaf, season with salt and pepper, and cook, stirring, until soft, about 5 minutes. Stir in tomato paste. Cook, stirring, until caramelized, about 2 minutes. Add okra, chicken stock, and tomatoes and bring to a boil. Reduce heat to medium-low, and cook, until okra is slightly tender but not mushy, about 20-30 minutes. Originally published on November 12, 2012 and September 26, 2016. Updated with new information. 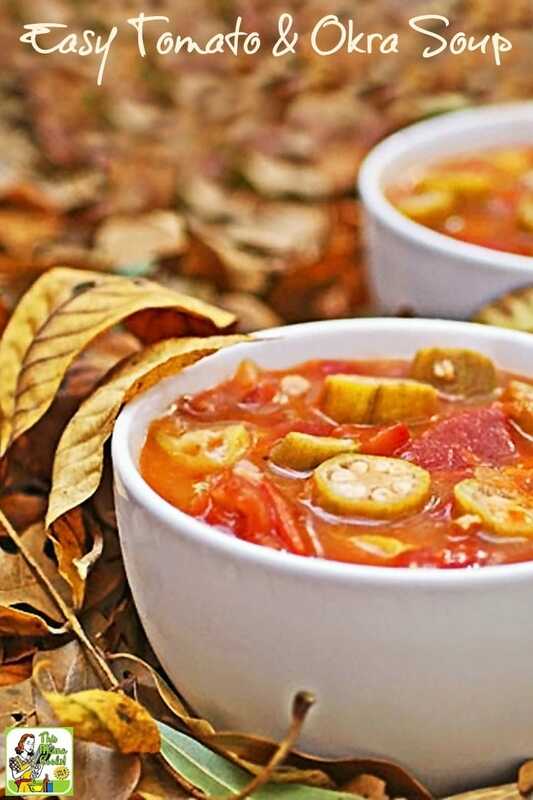 Perfect soup for fall. I only ever think of okra in soups and this one sounds great. We will just love this Okra Soup and can’t wait to make it, and this is a great recipe for the SRC. glad you found a recipe that you enjoyed from my blog. 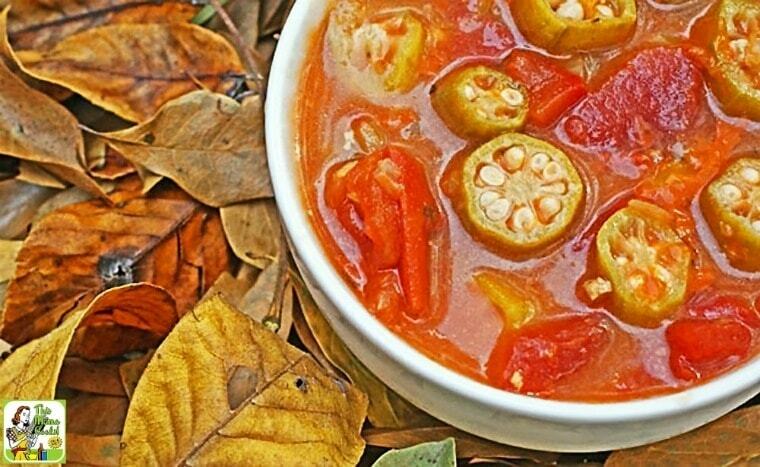 Your soup takes me back as I grew up on okra and tomatoes! My mother canned many jars of okra and tomatoes so we could have soup in the winter.So many people don’t like okra and I think they are missing a wonderful vegetable. Lovely images! I have only tried okra once, but this soup makes me want to try it again – it looks mouthwateringly delicious and so fresh. Great choice. Looks like a hearty warming bowl of soup perfect for the cold winter months.